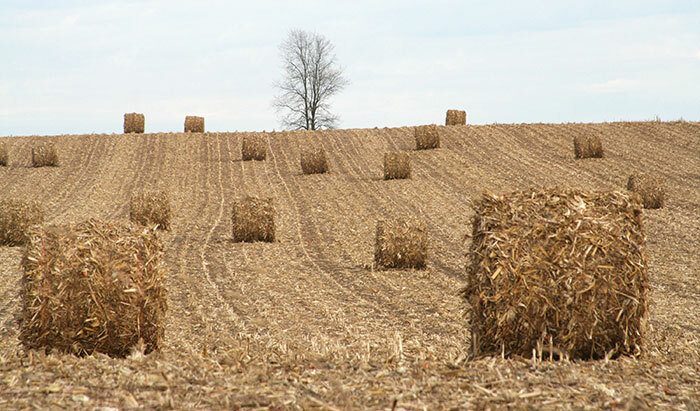 Unfavorable growing conditions in some regions have led to a shortage of stockpiled forages as a winter-feed source. This has put beef producers in an unfavorable situation. For producers who are considering purchasing expensive hay to feed their herd, there are other less expensive options. According to Kevin Gould, beef educator at Michigan State University (MSU), corn stover is one of those viable options. In an article published in MSU Extension’s Field Crops online newsletter, Gould provided advice on working with the winter-feeding option. When harvesting, aim for the top two-thirds of the plant, which includes the cob, husk, leaves, and upper stalk. Leave the lower 30 to 50 percent of the stalk in the field since it has a lower feed value and can be used to minimize soil erosion. Grazing is the most cost effective harvest option. Hurdles such as fencing, water, and location do present a challenge. Even with proper supplementation, grazing may only be available for 30 to 60 days. While grazing is only temporary, stored stover can be fed year-around. “Processing stover and windrowing from the combine generally works well,” Gould comments on harvesting. He recommends removing the chaff spreader from the combine to windrow the stover. Raking can be done to improve yields. Baling the corn stover will create a more stable feed source and allows for easier transport for feeding. While large square bales are the easiest to transport, they cost more per bale. According to Gould, custom baling rates can be $10 to $15 per bale, depending on size, wrapping, and processing. “Baling at 30 to 40 percent moisture and wrapping bales is another possibility, and adds a value of $10 to $15 per ton of dry matter,” Gould says. Wet ensiled bales will also feed better and can be injected with nitrogen to boost protein levels. “Bales will maintain quality up to 30 percent moisture when stored outside and fed during the winter months,” Gould explains. Cover or store inside any dry bales not used beyond the beginning of April. If moisture is above 20 percent, refrain from stacking bales inside due to the fire hazard. According to studies completed in mid-Michigan, stover can have 4 to 5 percent crude protein (CP). Since a cow’s requirement for CP is 8 to 10.5 percent, protein supplementation will be needed when feeding high-stover diets. Gould recommends dry distillers grains as a cost-effective protein source. The Michigan State studies found that stover baled from the windrows created by the combine has an ash content of about 7 percent. Raking in dry conditions will raise ash content another 3 to 4 percent due to higher soil levels in the bales. If stover is a cheaper alternative to expensive hay, what is the cost? “At stover removal rates of 2 tons per acre, the fertilizer value of corn stover, equipment, and labor costs associated with harvest total $55 to $60 per ton at 15 percent dry matter,” Gould states. He further explains that even with protein supplementation, a stover-based ration can lead to savings of $0.61 per head per day; that equates to about $110 per cow for a standard 180-day winter feeding period. Kassidy Buse was the 2018 Hay & Forage Grower summer editorial intern. She is from Bridgewater, S.D., and recently graduated from Iowa State University with a degree in animal science. Buse is currently attending the University of Nebraska-Lincoln pursuing a master’s degree in ruminant nutrition.